We went west today to the Legion of Honor, walked around Lands End, and ended up at the Cliff House. We also dropped by Nihonmachi (Japantown) on the way back. 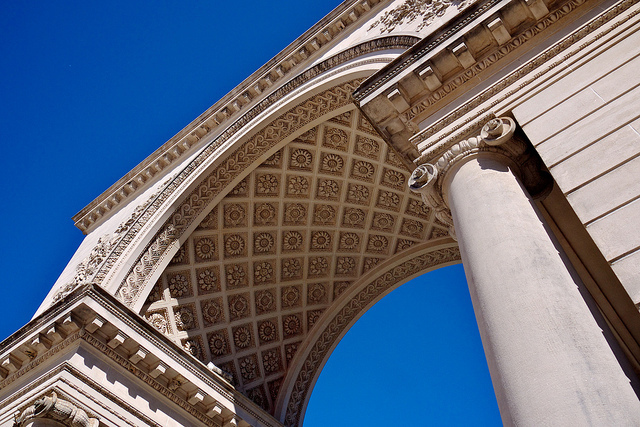 We arrived at the Legion of Honor just as it opened for the day. On the way, we went on a road that wandered through the Lincoln Park Municipal Golf Course, and saw some people taking their hacks. One of them wandered into the rough, picked up his ball, and walked back to the green. We didn't see anyone golfing with him, so I wonder how he scored that. Once inside the Legion of Honor, we made a beeline to the Rodin rooms. 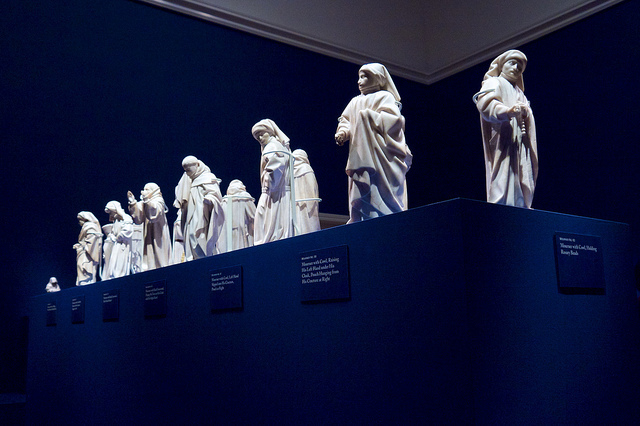 After that, we went through the rest of the rooms in order, starting with a temporary exhibit called The Mourners, which were small statues put onto the 15th century tombs from the Court of Burgundy. That was a treat; some of the statues were moving, some were spooky, all very well done. It's interesting to think they were on tombs, yet were so detailed all around. After going through the rest of the first floor, we headed to the basement to take a guided tour of the Pissarro special exhibit. The docent was quite knowledgeable but did tend towards the talkative side, so the tour ran about half again as long as scheduled. Once it was done, we were ready for lunch, and the museum café was the closest option. After fueling up, we made our way to the shore to walk the Lands End Trail. 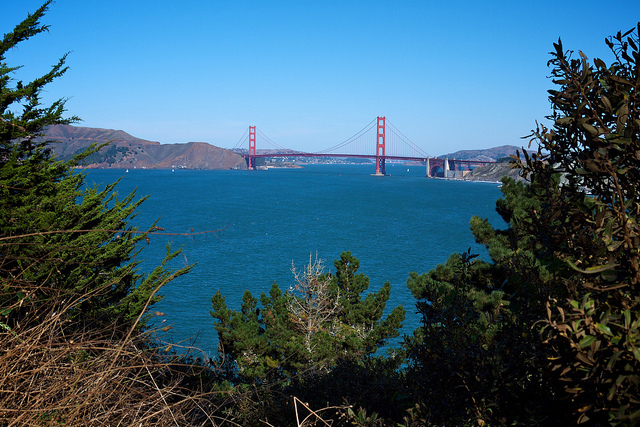 We saw many views of the Golden Gate Bridge, and it was interesting to see the west side of it for a change. At one point on the trail, there was a guy on a bike, and his girlfriend had a skateboard. She was putting the skateboard on the bike's handlebars and then climbing on top of that. She did make it and they were riding off, and were still upright when they rounded the corner out of our sight. Hope they were able to stop when necessary. 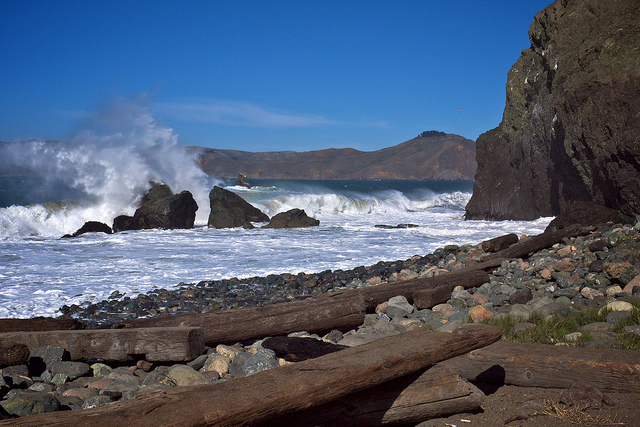 We also went down to Mile Rock Beach and sat for a while watching the waves break against the rocks. 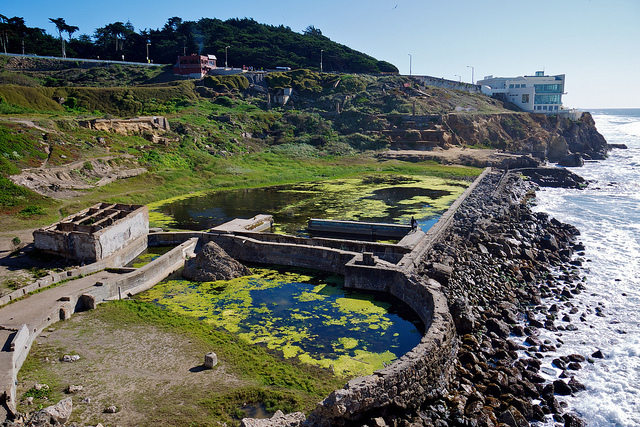 Continuing on, we reached the ruins of the Sutro Baths. We opted to not wander around the baths themselves, but several people did (making sure they were walking on the walls which weren't crumbling). Continuing along, we took a quick look in the Cliff House, then went into the Camera Obscura at its base. Unlike the one I went to in Bristol, England, this one was motorized, so it made the full circle by itself. 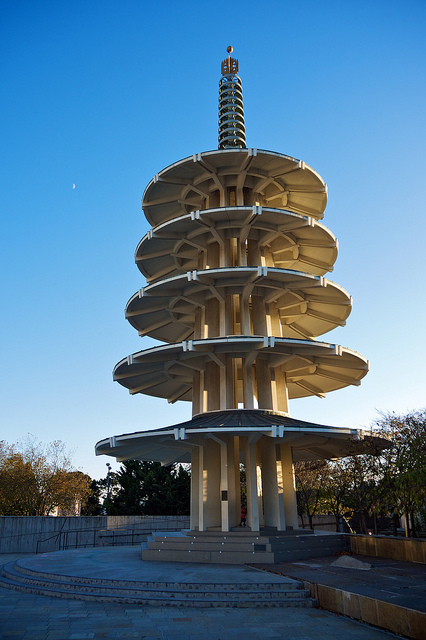 We were ready to sit for a while, but first we hopped on the bus to Japantown and wandered through Japan Center, a large mall of Japanese-themed stores and restaurants. We picked a place by a fountain and had an afternoon snack. Having fortified ourselves, we then picked a place for dinner, settling on udon. Very enjoyable. After that we came back to our room and called it a day.